Raven Boys takes off from the first pages. Right away, we are pulled into the life of Blue, a girl who’s family is psychic. Everyone but her that is. Every year, her mother and Blue go to the cemetery and write down the names of those who are about to pass. Blue can’t see the people at the cemetery, no does she possess any special powers. Until that night. This year, she goes with her aunt and this year she sees someone for the first time. 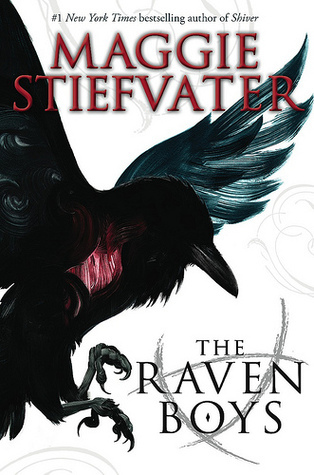 He’s one of the Raven Boys, and he’s either her one true love or someone she kills. When the Raven Boys walk into her life, everything changes. Honestly, I don’t even know where to start! This book is so much, too much. Maggie is fabulous at creating stories that pull you in and take your mind on a journey. Blue is a great character. She’s strong and smart, pushing herself beyond the comfortable to discover what lies beyond. Enter Gansey. I was very interested in how Maggie will introduce Gansey to the readers and let me tell you, it wasn’t what I expected. We see a lot of Gansey and his friends, because Maggie tell their stories along side of Blue’s. I really enjoyed this aspect. When you read this book, you need to read it. There is so much going on, you don’t want to miss anything. This book, this whole story was not what I expected. This is definitely a set up for the next books and I can’t wait to see where Maggie takes these characters. Honestly, that ending left me quite frustrated because I needed the next book right now! This book comes out September 18th, 2012! I’d love to hear your thoughts!